Previously secret documents reveal how the Bank of England (BoE) was ill-prepared for the 2008 financial crisis, partly because its governing body was made up of “cheerleaders” for the governor's policies. Documents published by the Bank on Wednesday provide a unique insight into the top-secret meetings of its board of directors, the Court, at the height of the financial crisis. The minutes show that Mervyn King, the Bank’s former Chairman, spoke of his confidence in the institution’s work just one day before the failed UK bank Northern Rock applied for a rescue loan. This led to the first British bank run in 150 years on September 13, 2007, as customers queued up outside Northern Rock branches to withdraw their savings. The Court’s job was to rescue banks from collapse. However, the minutes indicate the Bank was in disarray as it grappled with crisis after crisis. In addition to revealing the BoE’s ill-preparedness for the worst financial crisis in modern history, they also show the governor was rarely challenged by members of the Court and that the BoE believed private banks might welcome tougher controls on bonuses. The first significant warning sign of the impending financial crisis came on August 9, 2007, when French bank BNP Paribas publicly acknowledged its exposure to sub-prime mortgages in the US, causing its share price to drop 6.4 percent. Documents published by the BoE, under the direction of current Governor Mark Carney, reveal how ill prepared the Bank was for the extent of the crisis to come. “The Executive believed that the events of the last month had proven the sense and strength of the tripartite framework,” minutes from a meeting on 12 September 2007 assert. “Whereas some commentators might have suggested that the problems highlighted the drawbacks of separating central banking from supervision, the opposite was the case,” King is recorded as saying. Now discredited, the “tripartite framework” of regulation involved the BoE, Treasury and now-defunct Financial Services Authority (FSA) sharing responsibility between them. The next day, on September 13, Northern Rock applied to BoE for an emergency rescue loan. 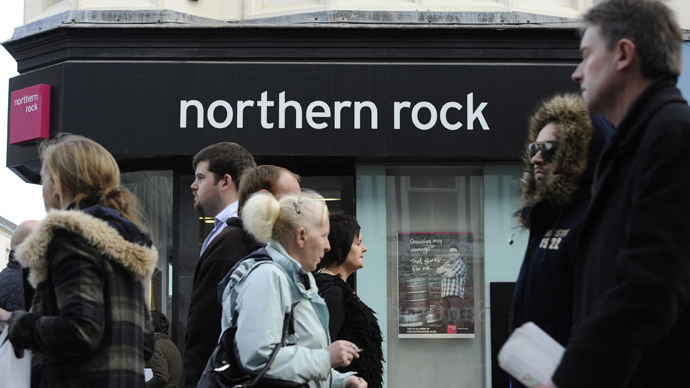 As the news went public, queues began to form outside Northern Rock branches throughout the country. A bank run followed, and the BoE stepped in. “Both the Bank and the FSA were in total agreement that if Northern Rock was allowed to fail it would create serious economic damage,” the minutes record. By December 2012, Mervyn King had completely changed his mind about the effectiveness of the “tripartite framework.” He proposed to the Court that the system be scrapped, and that the bank should assume more power over individual finance firms. The minutes also reveal how the Court failed to challenge the governor, often accepting his view without question. Speaking to the BBC, Andrew Tyrie, chairman of the Treasury select committee, said: “Even when questions were asked by individual non-executive directors, the executive usually presented a unified front to the Court, apparently rendering it of little or no use as a forum for creative discussion and constructive challenge." “The non-executive directors appear to have done little thinking of their own about financial stability and to have added little or no substantive value to the Bank's work on it,” he added. The court had merely acted as “cheerleaders” for the governor’s views, he said. Following the bailouts, the BoE was hopeful it could use its new influence to change private banks’ overly generous remuneration culture. Former Deputy Governor Paul Tucker is recorded as having expressed such a view, suggesting that banks might even welcome the imposition. “It was difficult for banks individually to take action whereas a collective approach would make it easier to change the culture of compensation,” he said. Tucker could not have been more wrong. What followed was a drawn out fight over the level of bonuses awarded within banks rescued by the state. The only significant intervention into capping bonuses since the crisis has come from an EU directive which took effect at the start of this year. This directive follows the British government’s decision to drop its legal challenge against the restrictions.